Slam dunk has netting all around for plenty of air and visibility, pillow front. Use soft balls only. 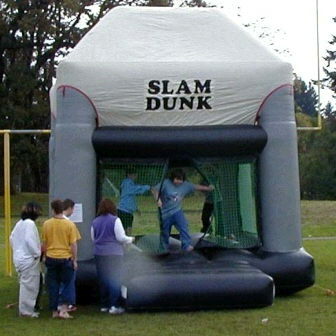 * Please call us for any questions on our moonwalk slam dunk 14x14x16 foot tall rentals in Ft. Wayne IN, Warsaw, Syracuse, Auburn, South Bend, Indianapolis IN.